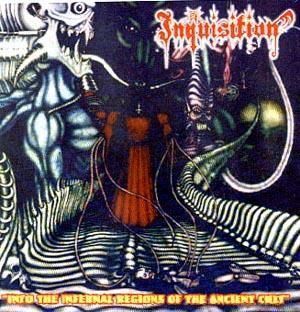 SR 02 INQUISITION "Into The Infernal Regions Of The Ancient Cult"
Arrrgggggg!!! . Hail The Cult: So it is done,our ritual is complete,we leave the infernal regions,our ancient cult is no longer hidden,we exit the ritual chamber.!! !Prepare for war!!!. Mystical violence. Black Metal atack!. New reedition from this malignant band.Really profesional horror. 2. Those Of The Night. 4. Empire Of Luciferian Race. 5. Summoned By Ancient Wizards Under A Black Moon. 7. Into the Infernal Regions Of The Ancient Cult. 8. Mighty Wargod of the Templars (Hail Baphomet). 9. Solitary Death in the Nocturnal Woodlands.